This document aims to explain most of the technical process and methodology that has been developed by LabLabLab while implementing three natural-language conversational games using ChatScript and Unity. This is not a replacement for either framework’s documentation, but rather something akin to a developer journal, or a specific use case with detailed examples. It should allow like-minded researchers to duplicate and expand this project further. All three of LabLabLab’s games use a combination of ChatScript for the natural language component and a Unity made interface exported as a web player package. The frontend and backend communicate through the websocket protocol, which operate over TCP sockets. Before going further, one should definitely look-up introductory documentation both to ChatScript and Unity, so as to understand how they work from a high level: see this Unity video for a quick introduction on how it handle 2D games; the ChatScript Input to Output Overview should explain the basis, although to make to most of this document, I would recommend reading through the Basic User Manual. Because most of the content is based on the LabLabLab’s games, the reader should also play a bit with our games to understand their gameplay mechanics and how it relate to the technology we’re using. At the core of the project resides ChatScript, a software created and maintained almost solely by Bruce Wilcox since 2010. It is a complete chatbot engine, used to create complex and rich “conversational robots”, with whom the user can have believable natural language (english) conversations. It implement everything that one might need to do so: natural language parsing, extensive ontologies, conversation volley & rejoinder system, wildcard matching, etc. While ChatScript is now well into version 6, the versions used by LabLabLab in production are 5.21 (A Tough Sell) and 5.52 (SimHamlet & SimProphet). ChatScript (CS) works by using a control script to direct user inputs towards different topics, where they will be responded to (or not). The matching rules/responses pairs are implemented using a mix of english, operators, modifiers and functions. 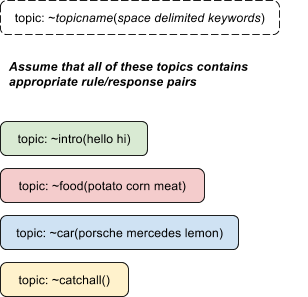 Topics are thematically arranged, user-created collections of rules/response pairs and keywords. When a response is found, the execution stops, the rule/response pair is marked as used, and the response is sent to the user. After determining which topic is the most relevant for a given input, CS parses this input to find a rule/response pair. For a concise explanation of the matching patterns available in CS, one should refer to the Pattern Redux documentation available from the Github repository. Of course, natural language forces us to assume that most of the time the input will use improper grammar or be incomplete, and CS makes provisions for this. First off, all CS files use the .top extension. One can also see that we use prefixes to identify special files. In this case, a_concepts.top is not a topic, but rather a place where we gathered all of our custom concepts. Since concepts can be compared to constant variables, using a single file to aggregate all of them curbs the problem of having to hunt for them in dozen of files when we want to change something. It is also important to note that having an a_ prefix insures that our concept file is compiled first and made available to files loaded after. Our regular topics are simply named with the topic they cover, in this case mostly character names. If they would reference or depend on each other in specific ways, one would want to prefix them them with a number to dictate when they are individually compiled. Finally, we have prefixed our system topics with z_, which means that they will be compiled after all other files. These files contain most of our script logic and concatenate our controls, making them more easily maintainable. Our control script obviously qualify as system topic (z_simplecontrole.top), just as our “catch all” topic do (z_catchall.top). Topics are paramount in ChatScript. From a structure standpoint, they should be viewed as classes in OOP: they are used to make the code manageable & reusable, while splitting it up in logical, thematic files (.top). This underline the importance of a structured outline, since the interactions will need to be divided and grouped together; the clearer the program outline, the easier it will be to break it into parts. The input “Do you own a porsche?” will check in ~intro topic and not find the keyword, then move to the previous topic (~car), find the keyword, find an hypothetical match and return its response. The input “I love meat” will check in the ~intro topic and not find the keyword, check ~car and not find the keywords, then will check ~food, find the keyword, find an hypothetical match and return its response. The input “I am a dog” will find no keyword or matches in any of the topics, and will go look up in ~catchall for a response. This further illustrate why catch all topics should always contain mostly generic rule/responses & gambits, alongside permanent responses (see the ^keep and ^repeat functions). This insures that all inputs are appropriately responded to, even when we find no match at all. A different type of topics are system topics, which are used to collect rules that apply to the execution of our script. Marking these topics as system topic will make sure that they are prioritized, never “forgotten” and that their content will not be checked for spelling mistakes. The control script, for instance, is a system topic. By separating our logic code from our regular response topics, we insure that we can maintain our bot more easily and completely oversee the flow of execution through the control script. System topics are very important to enforce structure and sanitize or process user input before responding to it. For example, a good candidate for a system topic would be a piece of script that parse the input for a certain word, replace it, and then direct the input the another topic for an actual response. For a list of topic flags (modifiers that can be added to your topics), see page 6 of the Advanced User Manual. One way to view rules and response pairs is as if statement with words being concurrent boolean conditions: if the word is matched, we get a true and move to the next part of the operation. If all operations add up to true, the bot will offer the response. This behavior appears naturally when we start adding literal boolean condition in our match patterns, so the bot respond only if certain conditions that might have nothing to do with the input are met. 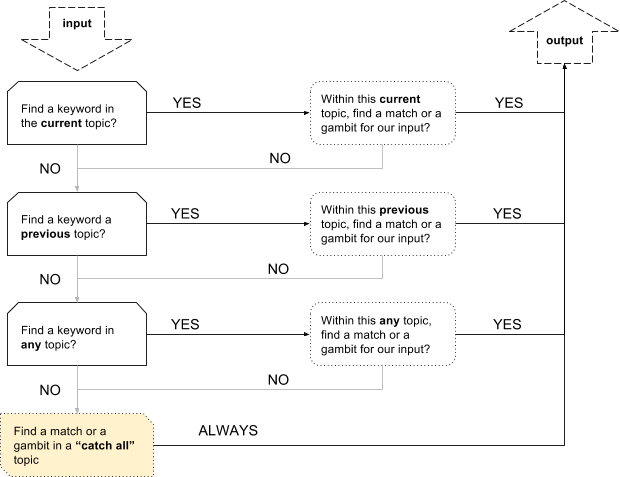 If you have not already, have a look at the Input to Output Overview to get a grasp of how content is matched and responded to in CS. u: (how be you) Fine thank you. s: PETAPET(!not _~verb _[dog cat]) Wait, you can _0 a _1?! It is important to remember that by default, CS will erase rule/response pairs as they are used to avoid letting the bot repeat itself on similar or identical inputs; each rule matches an input will be deleted for the duration of the conversation. This can be avoided on certain rule/response by using the ^keep and ^repeat function. This is also where execution flow becomes important: the files are parsed by CS from top to bottom, so what is at the top will always be tested out before what comes after. Concepts are the green ~word. You can see that we are using the IGNORESPELLING modifier, which will mark the terms in parenthesis as canonical and not validate their spelling against the dictionary when compiling the bot. For a list of system concepts (CS 6.3) see this document and for more on concept modifiers, see page 6 (“Advanced Concept”) of the Advanced Manual. On line 288, the script will look at the system variable %length and only go forward if it evaluate to more or equal to 3. Then it will simply look for any words in the ~motanciens concepts that is present in the input, and will output “You’re using it wrong” if it finds one. SimProhet: Sorry to be that guy, but you’re misusing ulmash. In other words, any matched word from the concept can be captured and reused as is, without reference to the concept it is part of. I’ve only included parts of the routine. Line 68 is the first line that is served to the user: the rule name GODNAME and the lack of any conditional in the rule hint to the fact that this rule is invoked with the ^gambit function. To make sure that the matched content will not be corrected, we change the parsing system by modifying the $token system variable on line 71, omitting DO_SPELLCHECK for the duration of this rule (remember the linear execution), adding it back at the end on line 173. Since this line is matched every time and used only to reset the $token system variable, we move the respond to the next gambit available in the current topic with the ^gambit rule. Now line 131, 134 & 141. They are variation of the same need: we want to break apart each component of the god name, so we must capture them individually. First with evaluate the length, then capture exactly one word (_*1) on line 131. With the construct ‘_0, we make sure to use the literal rather than canonical form. The splitting allows us to capitalize each word, then join them into our permanent $godname variable (line 132, 137 & 145). 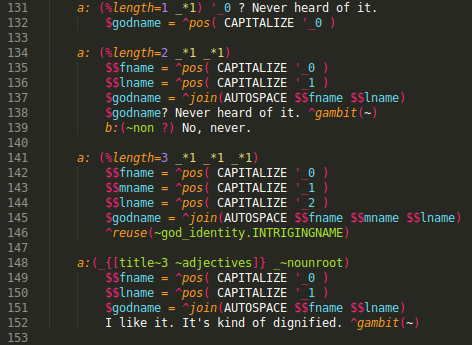 After adding the content to $godname, we have three slightly different behaviors. In the first example (line 132) we offer no response, so execution will move down to the next match in line (in this case, line 173). In the second example (line 138), assuming a $godname variable of “Beetlejuice”, the character will respond “Beetlejuice? Never hard of it”, then CS will affix the next gambit available in this topic. Finally, the last match will simply responds with the response in the ~god_identity topic named INTRIGINGNAME (line 146). None of these rules output a response, instead they parse the input for proper nouns and assign them to variables that will be used elsewhere. Since the control script detects that no response has been found, it keeps searching just as it normally would. Player: This apple looks good. Snow White: Yes it does! I got it from the store. Trying to match the last sentence, which would be parsed as “it be very red”, might not trigger anything in the apple topic where we want to be looking: nowhere in the query does the word “apple” appears. Our mechanism from above is more efficient combined with topic specific pronoun marking. As you can tell by the line numbers, this is at the top of the file: all inputs that are made while in this topic, regardless of their terms, will go through these six lines. If any of the words highlighted in yellow are found, they will be replaced by apple. Adding the ^repeat and ^keep function insures that CS does not discard these lines after they have been matched once. Since there is no response given, the control script will automatically keep searching for a response. This brings us to a specific need in the LabLabLab projects: in narrative driven games a lot more than in regular chatbots, it is central to keep track of the subject. Since variables can be either words or numerical values, we can use them to track and change gameplay properties and interface values, like it is done on line 13. 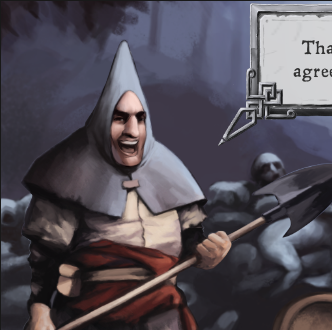 As previously mentioned, this is very important in a game as an end state has to be reached. By using variables and changing them on certain inputs or responses, we collect data that we can feed back to the interface (as ways to keep the score) or the the chatbot itself (as a way to trigger responses). s: ([teach show] * you * [_~verb ~vision_verbs act~1]) I’ve always wanted to ^post[VERB _0 INFINITIVE). s: (<<~dieu ~punition _ennemis>>) $godname would do that? I have tons of ^pos(NOUN _0 PLURAL)! The user-facing interface can be anything that communicate with our CS back-end: as one can see in the CS examples, the interface can be completely web based and quite minimalistic. Our need for Unity was born out of the requirements of a richer game interface with asset caching, audio, animations, keyboard inputs and so forth. This distinction between what effectively is the game engine (ChatScript) and the interface (Unity), opens up the possibility of integrating middleware components as well, such as analytics and voice recognition. Another benefit is that the two systems can be updated independently; the CS components can be updated often, while the interface can be updated on slower schedule. This removes a lot of the annoyances of having to upload updated build every time the chatbot is updated (which happens often). In its Unity interfaces, LabLabLab first used a mix of JS and C#, but finally transitioned into a uniform C# codebase for SimHamlet. Because of certain limitations early on, the connection to the CS back-end has been done in all three game through a PHP file that deals with the socket communication. This file offers an endpoint for our Unity interface to hit with a request and receive responses. It is likely that this could be replaced by a complete C# implementation, thus bypassing the need of a PHP server altogether. There is also the possibility of using more of a fully-featured proxy to communicate with CS for example. In the case of SimHamlet, CLol and CBored will be sent as part of the response’s body and indicate to Unity the need to animate the Gravedigger character appropriately. Then Unity will strip the command from the string before displaying it. Of course, these commands can take any form and merely act as action triggers from CS to Unity. Since the scope of LabLabLab’s games was quite restricted, this straightforward and simple implementation worked out well. However, it requires us to manage parsing on the front end and does not scale very well. To alleviate this, one can imagine a system topic containing a rule or macro appending interface variables to responses. With the help of a control script, this rule could be run after each and every rule/response pairs and be formatted to minimize front-end processing. 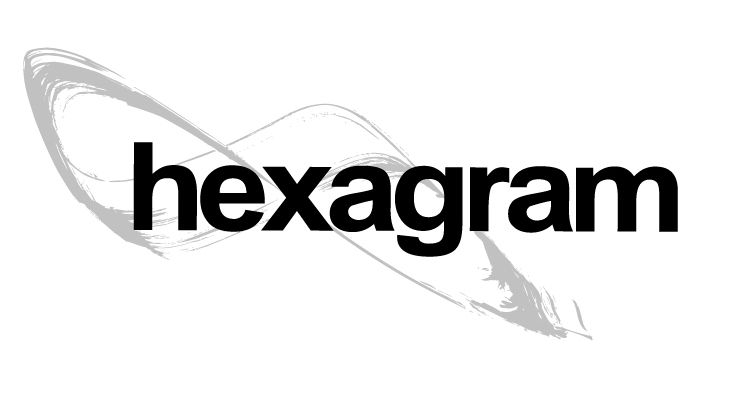 This web site is now up, so that is news.